Organizing your kitchen is an important task when you live in an apartment because you need to maximize all of the cabinet space you have. Yet many of the kitchen organization hacks you will find online show massive spaces that look like they came out of a mansion, not an apartment in Chicago. If you’re looking to get just a little more organized in your kitchen, check out these hacks that are definitely apartment-friendly! The inside of your cabinet doors, particularly your pantry, can be a great storage option that you’re overlooking. Hang a spice rack from these, and organize your spices with ease! Add a memo pad, and keep your shopping list close at hand. You can even mount small containers to hold your pens and pencils or other small items that you need regularly. Everyone needs their knives close at hand, but a knife block takes a lot of counter space and creates unwanted clutter. Instead, mount a magnetic knife strip to your backsplash using mark-free wall hangers. These are affordable, attractive and handy, keeping your cutlery within reach at all times. Do you have any unused wall space in your kitchen? If so, ask if you can add a shelf or pegboard to it that you can use for storage. Are you utilizing the space above the cabinets? This can be an excellent spot to house your coffee mug selection or larger countertop appliances. Don’t forget about the exposed sides of your cabinets where you could hang your larger spoons and utensils or even your knife strip. 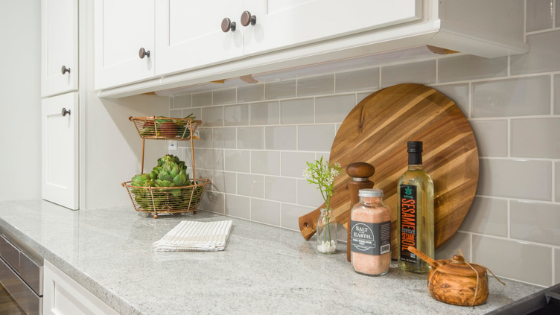 An over-the-sink cutting board will give you more counter space whenever you’re prepping dinner. This can also make it easy to wash your produce and chop it without dripping water all over the kitchen floor. Store the cutting board easily by standing it on its side and sliding it into the pantry. Remember, with the right kitchen to start with, your organization will be even easier. Check out the gourmet kitchens in our Chicago apartments today, or schedule a tour of North Harbor Tower to see our beautiful kitchens for yourself.